Many of you have seen the petition from Food Babe Vani Hari asking Kellogg’s to remove BHT from their cereal. If you haven’t, here’s the link to her blog post. But do you know what BHT is and why you should avoid it? And do you know that BHA and TBHQ are other very similar harmful preservatives being used in our foods? Besides cereal, these preservatives are used in a lot of oils and sprays too. If a bakery sprays a pan with oil containing BHT, they aren’t going to list that on the ingredients of the finished baked good or bread. Most fast food companies use oil containing one of these three preservatives, which is why very few restaurant fries are ADHD-friendly. Five Guys fries are one of the few fries that do not contain preservatives (and they’re good!). They use peanut oil though if you are allergic to peanuts. Nearly all mainstream cereals use BHT to preserve their cereal. Sometimes this ingredient is listed on the box, and sometimes it isn’t. Here’s a box of Rice Krispy cereal with BHT clearly listed. But they don’t always list it. They can spray the inside of the bag with the preservatives and get away with not listing it, but these preservatives are leaching into your food or drink. This is a common practice with some refrigerated boxed juices and milk as well. A friend of mine called Costco inquiring if preservatives were used on their Kirkland line of organic rice milk. It was not listed on the box. Sure enough, they admitted that their supplier did add BHA to one of the ingredients they used in the rice milk (the vitamin A palmitate). So much for “organic.” See this post here for more details on that. We use Pacific rice milk. Some products claim to contain no preservatives and even state that on the box but the bag or inside of the box can be sprayed with preservatives. While they are technically not lying – they aren’t “adding” preservatives; they are spraying the bags with it. Either way, it’s getting into your food. Pepperidge Farm claims to not add preservatives to their “natural” Goldfish but many Feingold members believe they do. Pepperidge Farm is very secretive about their ingredients, not even listing them on their web site like most manufacturers do. Many Goldfish varieties also contain MSG, hidden in “autolyzed yeast extract.” It’s no wonder our little ones are addicted to them. A better option that we know does not contain preservatives would be Annie’s Cheddar Bunnies or Cheddar Squares, Late July, or a few others. Be aware that some Annie’s crackers contain MSG though they started taking it out of some of their products. If you’re a Feingold member, check your shopping guide or contact Annie’s. Preservatives are just as problematic as dyes and artificial flavors. Some are made from petroleum as well. Before writing this book, I didn’t know very much about the dangers of preservatives. I just knew that Feingold said they were bad and caused an adverse reaction in my kids. That was enough for me. We avoided them. The preservatives avoided on Feingold are BHA, BHT, and TBHQ. They are sometimes listed as just “antioxidants” because they keep food, particularly oils and fats, from going rancid. A chef I know said she wouldn’t feed this stuff to her dogs – and rightly so. Researchers have done studies on feeding BHT and BHA to animals and here is what one researcher had to say. BHA gives me a headache. I was buying some GFCF cupcakes from the health food store that were made at a local bakery. The ingredients read clean but every time I ate them, I got a headache the following day. I decided to contact the manufacturer to find out if the cupcakes contained any unacceptable ingredients. Sure enough, they use oil that contains BHA to spray their pans, which was not listed on their ingredients. No more cupcakes for me. BHA and BHT were originally developed to serve as a preservative for petroleum. In the 1950’s, BHA and BHT were approved for use in food. 19 The preservatives are mostly used to preserve fats and oils but are also used in cosmetics, toiletries, and medicines. It is best to buy cold pressed oils to try to avoid these preservatives. TBHQ was approved for use in food in the early 2000’s and is a chemical that is derived from petroleum and is a form of butane. 20 It was a sad day in our house when Feingold announced Eggo Buttermilk waffles which were once approved were adding TBHQ. We went out and found all the remaining Eggos we could find that still had the old ingredients. 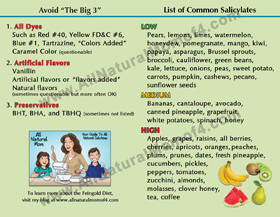 Some people will argue that a person would have to eat a large amount of these preservatives in order to cause some of these more severe symptoms. I agree. However, what happens when a small, developing child or toddler consumes these preservatives? Many Feingold members report that TBHQ causes their kids to become extremely angry, crabby, or weepy. What happens when they consume these preservatives daily, over the course of 30, 40, or 50 years? Studies have already shown that TBHQ is a carcinogen. Why would I want to chance this on my child when there are other food options available that do not use TBHQ as a preservative? Why would some food manufacturers use TBHQ and others not? In my opinion, I believe it comes down to money. For example, if a food manufacturer uses TBHQ, maybe they would get three years shelf life out of their product. If they do not use TBHQ, they would either have to use another more natural preservative that is more costly, or they would forfeit the shelf life of their product, making it only good for perhaps one year instead of three. If they don’t sell all of their products within one year from production, they would have to discard all of them. And if consumers don’t know manufacturers are using a dangerous chemical to preserve their food, or no one makes an issue out of it, they’re going to continue to use it so they can make more of a profit. This is where we as consumers come in. Tell manufacturers you don’t want them using dangerous chemicals in your food. Or, stop buying foods with chemicals and urge your family and friends to do the same. Eventually, the drop in sales will affect their bottom line, and manufacturers will be forced to make better products. We are already seeing this happening with some products which is awesome. If I have piqued your interest in removing these harmful chemicals from your family’s diet, keep reading. I’ll tell you why and how we started the Feingold Diet and how you can avoid all these harmful additives. So what are your options then if so many of these cereals contain BHT or other preservatives? There are plenty of more natural options but you might not find them in the regular cereal aisle of your mainstream grocery store. You may have to find the “Natural” section of your store or take a trip to your local health food store, Woodman’s, Mariano’s, Trader Joe’s, or Whole Foods for more options. Below are some of our favorites (we are mostly gluten and dairy free in our house). The one lone mainstream cereal that does not contain preservatives? Kellogg’s Crispix! Horray! ONE cereal! Not sure how that one got so lucky but we’ll take it! We use it to make Puppy Chow. See here for the recipe. If you become a member of Feingold, you will get a 400-page shopping guide listing out foods that do not contain these three harmful preservatives. They contact the manufacturer to find out if they use the preservatives at all, even in the packaging or if their supplier uses it. 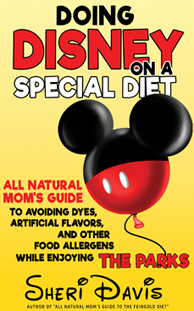 They do the same for dyes and artificial flavors. It’s nice to not have to play the guessing game or spend hours grocery shopping reading labels. But if a Feingold membership isn’t feasible right now, at least read the labels and avoid those foods with these preservatives listed. And a big THANK YOU to Vani Hari and the Food Babe team for bringing awareness to the dangers of BHT. I met Vani a couple of years ago when she was in the Chicago area petitioning for Kraft to remove dyes from their mac-n-cheese. See my post here. While she gets some criticism for how she goes about getting these companies to remove harmful chemicals from their food, the fact is, she’s making an impact on the food industry for the better. Most people are not aware of what is in the foods they are feeding their kids and how it can affect them. And if you haven’t done so already, please sign the petition for Kellogg’s to remove BHT from their cereal. This would make a big statement to other food companies who are also using BHT to preserve their foods. I’m not sure how long the petition will be up for but because we have used our collective voice to tell food manufacturers that we want better ingredients, General Mills has announced it will start to take BHT out of their cereals. No word on a timeline though so that remains yet to be seen. But it’s hopefully a good sign. And I don’t think Vani is going to go away until it is a done deal. 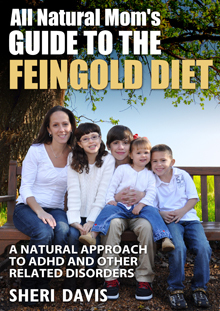 For an insider’s view on the Feingold Diet check out my new book, “All Natural Mom’s Guide to the Feingold Diet” now available on Amazon in e-book and paperback! 18. Llaurado, JG. “The Saga of BHT and BHA in Life Extension Myths.” Journal of the American College of Nutrition. 1985: 481-4. Accessed at http://www.ncbi.nlm.nih.gov/pubmed/4045049. 19. Race, Sharla. “Antioxidants: The Truth About BHA, BHT, TBHQ and Other Antioxidants Used As Food Additives.” United Kingdom: Tigmor Books, 2009: Accessed at http://www.foodcanmakeyouill.co.uk/library/content/Antioxidants.pdf. 20. Wells, S.D. “For Added Freshness” Label Claim Really Means “Added Chemicals” When It Comes to BHA and BHT.” 12/16/11. www.naturalnews.com. Natural News. Accessed at http://www.naturalnews.com/034418_added_freshness_BHA_BHT.html. 21. Eng, Monica and Deardorff, Julie. “Illinois Takes Steps to Ban Trans Fats.” 04/13/11. Chicago Tribune. http://articles.chicagotribune.com/2011-04-13/health/ct-met-trans-fat-ban-20110413_1_trans-fats-fats-from-french-fries-illinois-restaurant-association. 22. Botes, Shona. “TBHQ: Why This Preservative Should Be Avoided.” 2/14/11. www.naturalnews.com. Natural News. 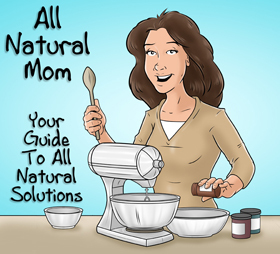 Accessed at http://www.naturalnews.com/031318_TBHQ_food_preservatives.html.